RFID solutions give you the real-time asset visibility you need to streamline operations, maximise asset utilization and error-proof asset-related data. Only Zebra provides end-to-end solution simplicity with every thing you need to implement RFID in your organisation — from well-tested, industry-leading infrastructure to the expertise you need to maximise the benefits of RFID in your enterprise. Selecting the right RFID labels for your application can be complicated. Zebra now offers the widest selection of in-stock Zebra UHF RFID Tag Labels, designed for and tested with Zebra printers, as well as Zebra RFID readers. We have options for general purpose, advanced and specialty use applications, in a variety of sizes and materials, using inlays from leading manufacturers to meet your needs. When you choose zebra for your RFID printing needs, you get the industry-best encoding accuracy needed to ensure the right data is embedded in every tag. And whether you need to print high, mid or low volumes of item hang tags, case and pallet labels or RFID-enabled ID, royalty or membership cards, we have a printer that is perfect for the job. A larger RFID inlay gives you longer read ranges. Handheld, fixed and overhead readers often perform differently and serve different use cases. Surface of the material, such as corrugate box, wood, glass, plastic, metal, etc, as well as how densely items are stacked, or what is contained within the boxes, can affect the read range. Due to the many variables that can affect read range, we recommend testing labels in your actual environment to determine which label works best for your application. Your Zebra supplies representative can provide samples for testing. Additionally, by utilizing long-standing partnerships with the leading RFID inlay providers, Zebra can create custom RFID labels to make a label specific to your needs. Please contact us for details. These labels are designed for use with standard RFID readers and are stocked in a variety of inlay types and sizes. They are available in paper and synthetic materials that work on non-metallic surfaces, plastics or corrugate. These labels offer a higher level of read performance than our general purpose labels. Regularly used in retail, healthcare and manufacturing applications. Same as General Purpose applications, where longer read ranges are required. For specialty situations, such as asset tagging on metal surface or for liquid-filled containers, we offer Silverline on-metal labels. 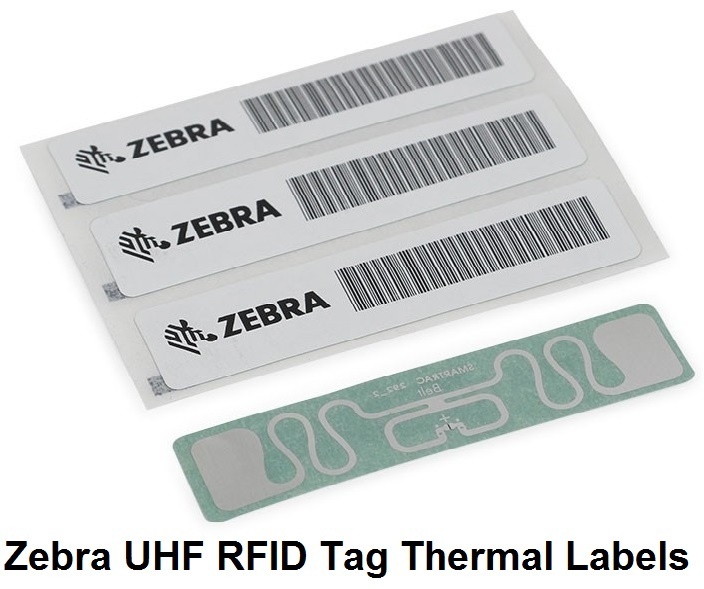 Zebra Thermal Transfer UHF RFID Label Tags, Size: 97mm x 15mm, Inlay Type: Short Dipole, Antenna/ Chip: Short Dipole w/Monza 4D, 1000 Labels per roll - 76mm (3 inch) Core with max. OD of 127mm (5 inch). For use with Zebra UHF Desktop Printers ZD500R,RXi4, ZT410R and ZT420R. RFID UHF Label - Thermal Transfer Paper Labels - Permanent Acryllic Adhesive - Short Dipole Inlay - 97mm x 15mm - Labels per Roll: 1000 - Rolls per Box: 1 - Compatible with: ZD500R - Rolls supplied on 76mm cores with maximum outer diameter 127mm. Zebra Thermal Transfer UHF RFID Label Tags, Size: 100x40mm, Thermal Transfer Printable White PET, 50/roll, 1 Roll per Box. - RFID Media - Label - RFID, Size: 3.94x1.57in (100x40mm), Thermal Transfer Printable White PET - High Performance Acrylic Adhesive - 3in (76.2mm) Core - 350/roll - 1/box - Plain - Order by Box - 1 Roll per Box. Zebra Thermal Transfer UHF RFID Label Tags, Size: 3.94 x 0.51in (100mm x 13mm) - Printable White PET - High Performance Acrylic Adhesive - 3in (76.2mm) core - 800 Labels/Roll - 1 Roll per Box - Plain.